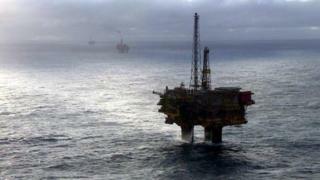 The warning comes in Oil and Gas UK's latest economic report. The report said it was "vital that arrangements are in place between the UK and EU to allow the continued frictionless movement of people". But it said investors "will continue to favour a conservative outlook" because of the continued volatility of the oil price. EU citizens make a huge contribution to the oil and gas industry and we've provided certainty to the industry that employers will be free to continue recruiting from Europe up until 2020. Chief executive Deirdre Michie said: "Industry is emerging from one of the most testing downturns in its history. However, the steps that have been taken by industry, government and the regulator have delivered tangible results. "Despite the improvements seen in recent years, we find ourselves at a crossroads. Record low drilling activity, coupled with the supply chain squeeze, threaten industry's ability to effectively service an increase in activity and maximise economic recovery. "The UK Continental Shelf (UKCS) is a more attractive investment proposition - our challenge now is to take advantage of this. "We have to drive an increase in activity while continuing to find and implement even more efficient ways of working which support the health of supply chain companies whilst also keeping costs under control." This has followed an industry-wide drive to bring down costs and extend the life of the UK sector. A spokesman for the Department for Business, Energy and Industrial Strategy said: "The oil and gas industry is crucial to the UK's economy and energy security. That's why we are providing a £2.3bn support package of measures. "EU citizens make a huge contribution to the oil and gas industry and we've provided certainty to the industry that employers will be free to continue recruiting from Europe up until 2020."